It took approximately 45 minutes in McKinney, a conservative bastion in North Texas. It took about a half hour in Austin, the unapologetically liberal seat of state government. But no matter what, in a pair of town halls meant to address veterans’ issues this week, U.S. Sen. Ted Cruz, R-Texas, faced sharp questions about Republicans’ plan to repeal and replace Obamacare, leading to spirited — sometimes testy — exchanges with his constituents. “You all on the Hill are scaring the living daylights out of us,” one woman told Cruz in McKinney. The town halls were part of a congressional recess that Cruz is using to crisscross Texas at a critical time for both him and his party. The GOP’s year-long push to scrap the health care law hangs in the balance, with the Senate scrambling to build support for its bill after delaying a vote last week. The stakes are particularly high for Cruz, who ran for Senate in 2012 vowing to obliterate the law and has emerged as a key negotiator in trying to nudge the Senate plan in a more conservative direction. In the town halls and a flurry of media appearances this week across Texas, Cruz has been pitching his Consumer Freedom Amendment, which would allow insurers to continue selling plans that meet Obamacare requirements but also plans that do not comply with the law. The amendment has the backing of the White House and influential conservative groups, but it appears to be an open question — at best — whether some of his fellow Republicans in the Senate, especially the more moderate ones, could vote for it. In recent days, Cruz has acknowledged the Senate bill remains in a precarious position, saying he is not sure lawmakers will ultimately be able to get it done. If they do not, Cruz told reporters Thursday in Austin, President Donald Trump is “absolutely right” in his suggestion that they should instead focus on repealing the law first and replacing it later. Asked if he anticipates being blamed should the current effort collapse, Cruz offered the closest thing to a moment of self-reflection since he embarked on the home-state tour. Cruz’s remark came after the town hall in Austin, where a health care-related question from an audience member led to a nearly 20-minute exchange with another part of the room that was less friendly to him. Much of that back and forth was between Cruz and Gary Marsh, a 67-year-old retiree from Austin who grilled Cruz on why he is not working to “fix” the problems he sees with Obamacare instead of repealing. At one point, the moderator tried to move on, but Cruz stopped him, saying he wanted to give Marsh a chance to respond — something he had promised at the outset of the conversation. Cruz nonetheless held firm in his views throughout the exchange, including when he rejected Marsh’s request to cease calling the law Obamacare and use its formal name, the Affordable Care Act. “I don’t believe in deceptive speech,” Cruz said. The woman from the McKinney event, Misty Hook, a psychologist from Allen, said she offers counseling to local veterans at a discount through the VA Choice Program. She told Cruz that she was concerned the proposed GOP reforms might make it more difficult for her to get reimbursed by insurance companies for providing mental health services. Cruz said that when private plans are required to provide all of Obamacare’s essential health benefits, like mental health, care becomes untenably costly for the average American. “Obamacare, the last seven years, has proven to be a manifest disaster," Cruz said. "Not for us," Hook interjected. Both events were met with protests numbering well over 100 people. In McKinney, protesters — including one dressed in a head-to-toe grim reaper outfit — stood for hours as a sweltering heat turned into a light rain. In Austin, protesters swarmed a street corner, with one particular sign dwarfing the others. “Repeal and Replace Senator Ted Cruz,” it read. The town halls themselves were relatively controlled. Attendees had to register ahead of time, and many found out about the events through the email list and Facebook page for the host, Concerned Veterans for America, a conservative advocacy group. CVA spokeswoman Rebecca Coffman noted that although space in the McKinney and Austin venues was limited, the events were free and registration was open to the public. Organizers culled audience questions because of time constraints, but they did not screen for content, she said. 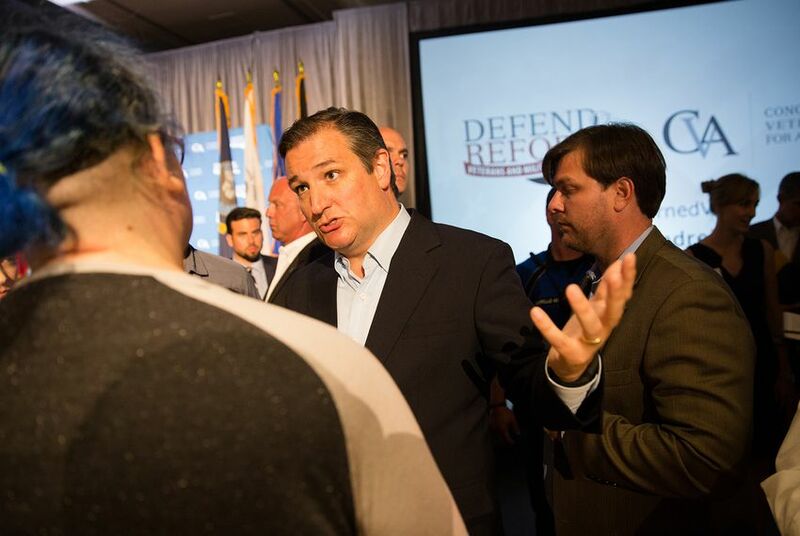 The veterans town halls were serene compared to the scene that greeted Cruz at an Independence Day ceremony in the Democratic stronghold of McAllen. For much of his brief remarks, Cruz had to speak over a group of protesters — many waving signs about health care — arrayed on the bleachers steps away from the stage. The protesters were joined by a contingent of Cruz supporters who did their best to drown out the opposition. Texas’ senior U.S. senator, Majority Whip John Cornyn, has kept a lower profile during the congressional recess. As of Thursday afternoon, Cornyn's office had not announced any public events for the week in Texas. Unlike Cornyn, Cruz is up for re-election in 2018, and he faces a challenge from U.S. Rep. Beto O'Rourke, D-El Paso. O’Rourke spent July Fourth in Lubbock and other deeply conservative parts of West Texas, where he reminded supporters of Cruz’s key role in the Senate’s Obamacare repeal process. Appearing at a Lubbock barbecue restaurant on the eve of the holiday, O’Rourke spoke critically of “a Senate that just in secret, behind closed doors — no women allowed — negotiated a health care bill,” getting drowned out by boos before he could continue. “And your junior senator was one of those secret negotiators,” added O’Rourke, who is pushing for a single-payer health care system. Cruz, for his part, has studiously avoided engaging O’Rourke since the congressman launched his underdog campaign in March. But back home this week, he betrayed some signs he is in re-election mode even as the health care debate rages on in Washington. Cruz is scheduled to attend the third and final veterans town hall Saturday in Houston. Ted Cruz on health care overhaul: "We have got to get it done"